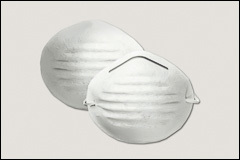 Items listed below are NIOSH approved particulate respirators, except the G1610, which is a non-approved dust mask. Not NIOSH approved. Lightweight disposable mask. Provides basic protection from dust, pollens, and other non-toxic airborne nuisance dust. Adjustable nose bridge clip offers a secure fit. Universal size fits most face shapes and sizes. Sold by the box, 50/box, 12 boxes/case. SAF-T-FIT® Plus series respirators have been redesigned for improved fit and lower breathing resistance. Nose clip is color-coded for visible size recognition. Molded cup design and durable suspension straps. Latex-free. Humidity-resistant filter media. Sold by the box, 20/box.